5) The explosive subsequent growth of real estate and stock prices to their current levels. This series of events was not random or inexplicable, but was the result of the United States moving through cycles of crisis and the containment of crisis, with an unprecedented degree of heavy-handed interventions by the Federal Reserve feeding the cycles and deeply distorting investment results. 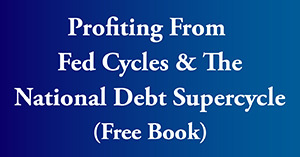 C) The amplified losses and amplified profits that result from the new cycles of Federal Reserve interventions are not random but can be at least partially anticipated in advance through understanding the double trap (of its own making) that the Fed is now caught in over the long term, and anticipating the market effects of the known strategies that the Fed has been using in the past and/or intends to use in the future. Using a matrix, with the cycles as the columns and the investment categories as the rows, we will introduce a new framework for seeing and understanding the many investment implications of the cycles in an environment where the economy and markets are still dominated by heavy-handed Fed interventions. 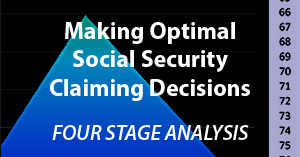 This framework can be systematically applied to identify the logical sequences of nontraditional risks and heightened opportunities for each of the individual major investment categories at each of the different stages in the cycles, as well as in each of the transition points between the cycles. This analysis is the first chapter in a free book, an overview of the rest of the book is linked here. The recession of 2001 was not a normal business cycle recession, but was abnormal, because it was triggered in part by the collapse of an asset bubble: the tech stock bubble. Losses were unusually severe for investors and confidence was shaken; it was a crisis for the markets. In order to contain the crisis and reboot the economy, the Federal Reserve responded with an unusually powerful intervention. The Federal Reserve pushed the effective Federal Funds rate down from 6.40% to 0.98%, which took interest rates to their lowest level in almost 50 years. This swift move downward can be seen next to the red numeral "1" in the graph above. The extraordinarily powerful move by the Fed in the attempt to contain crisis took interest rates down to a place they had not been in many years, which is shown as the golden outlier range above. Now, per investment theory, the "risk free rate" is part of the foundation for investment prices and yields in almost all investment categories. So when the Fed pushed the risk free rate down from 5.40% to below 1%, it was as if it were swinging a giant sledgehammer downwards, with a force the markets had not seen in the modern era. By swiftly knocking interest rates downwards, the Fed also swiftly knocked mortgage rates downwards, which made homes far more affordable - and this was one of the key underlying components in creating the real estate bubble. Scroll back and forth between the two graphs, and look at the red number 1s, as well as the golden areas of the outliers. In the attempt to escape a cycle of crisis, the Fed smashed interest rates down into the golden outlier range. As part of a cycle of the containment of crisis, the golden outlier area of one of the most profitable real estate markets in history was created, completely breaking out of the previous patterns (even on an inflation-adjusted basis). Indeed, in most investment asset categories, a lower risk free rate means potentially much higher asset prices, and the Fed's rapidly forcing low interest rates can be likened to swinging a sledgehammer at an old style carnival attraction, trying to ring the bell. Real estate prices soared, stock prices recovered, and Wall Street began to take huge risks that were effectively based on real estate prices climbing forever. 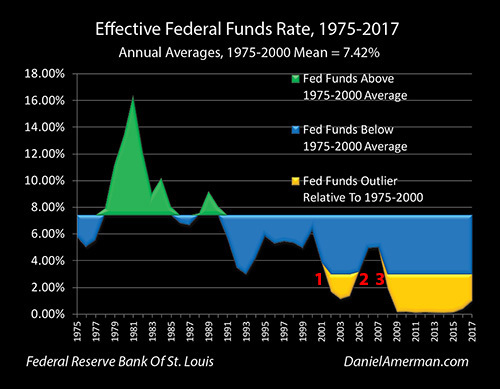 Until they didn't - and one key component can be seen on the Fed Funds Graph by the red number 2, where interest rates climbed rapidly upwards and out of the golden outlier range, as part of a cycle of exiting the containment of crisis. There were many other factors as well, but the end results were the real estate bubble popping, the Financial Crisis of 2008, and the Great Recession. It is now worth scrolling back and forth again, and looking at the red number 2s on both graphs, with a cycle of sharp increases in interest rates being followed (over time) by a cycle of the steepest decline in real estate prices in U.S. history. So how did the Fed respond to the new cycle of crisis? By swinging that sledgehammer down harder than it had ever been swung before, and thereby intervening more aggressively in all investment market prices. It swiftly pushed interest rates down to effectively zero percent, the lowest in the modern era, and it reinforced the power of the sledgehammer with unprecedented and successive rounds of quantitative easing, creating trillions of new dollars. As part of a cycle of the containment of crisis, the Fed forced interest rates to all-time lows, as seen by the red numeral 3 on the Fed Funds graph. And ultimately, the carnival bells began to ring again, and there were new record or near record prices for many investment assets, including real estate, bonds and stocks. So what we have seen over the last 20 years has been: asset bubble... crisis... Fed sledgehammer to contain crisis... high asset prices... asset bubble... crisis... Fed sledgehammer to contain crisis... high asset prices... asset bubble...??? Is that a pattern? Could it happen again? Is it happening again? When we take that cyclical perspective - the abnormalities disappear and the data far better fits the model. The sharp losses caused by the popping of asset bubbles become rational and expected. 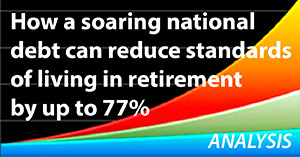 Federal Reserve interventions and the destruction of interest income for retirement investors becomes rational and expected. Most importantly, record or near record prices for stocks, bonds, real estate and precious metals all become rational and expected at various points in the cycle. The last twenty years have included some of the worst financial conditions that most of us have experienced in our lifetimes. The last twenty years have also included some of the most profitable market conditions that we have ever seen. Both are true simultaneously - and there is good reason to think that both could potentially be true in the future. To protect ourselves from the risks and to position ourselves to profit from the opportunities, we have to be able to truly see and understand the logical relationships between crisis, the containment of crisis, and investment price movements in each of the major asset categories. To help people visualize and understand how cycles of crisis and the containment of crisis create both risks and opportunities for investors, I created the Red/Black matrix below. The core of the matrix is the columns, which are the color-coded cycles of crisis and the containment of crisis. The Red "A" column represents a cycle of crisis. The Black "B" column represents a cycle of the containment of crisis. The Red/Black "C" column is the cyclical movement from crisis to the containment of crisis. The Black/Red "D" column is the cyclical movement from the containment of crisis back into crisis. The first six rows are the investment categories at each place in the cycles, with the implications for risks and returns in that category. The six rows are 1) cash & equivalents; 2) stocks; 3) bonds; 4) REITs & real estate; 5) precious metals; and 6) cryptocurrencies. Now, let's go back to our quick look at real estate prices during cycles of crisis and the containment of crisis. All we were looking at was one row - the #4 row of REITs and real estate. It was a portion of that row, because there is much more to real estate than just single family housing. The tech stock bubble collapse and subsequent recession is the red "A" column, as is the financial crisis of 2008. How real estate behaves in crisis is the intersection of the "A" column with the 4th row, which is cell A4. The Fed slashing interest rates to exit the 2001 recession is the black "B" column, as is the Fed slashing interest rates and engaging in quantitative easing to try to contain the damage after the crisis of 2008. 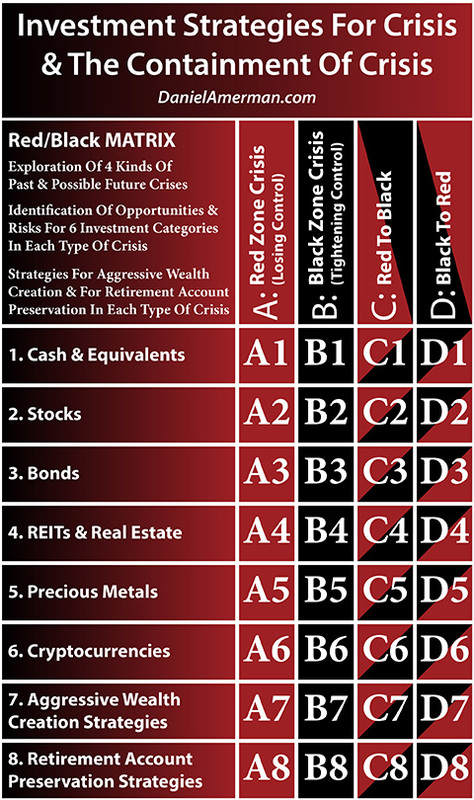 How real estate behaves during the containment of crisis is the intersection of the "B" column with the 4th row, which is cell B4. When we look at red numeral 1 above and the towering spike of real estate prices, we are seeing the movement of prices out of crisis and into the containment of crisis, which is column "C", and row 4, which is cell C4. The second towering golden spike labeled with red numeral "3" is the eventual recovery of real estate prices after a cycle of crisis and during a cycle of the containment of crisis - which is also cell C4. 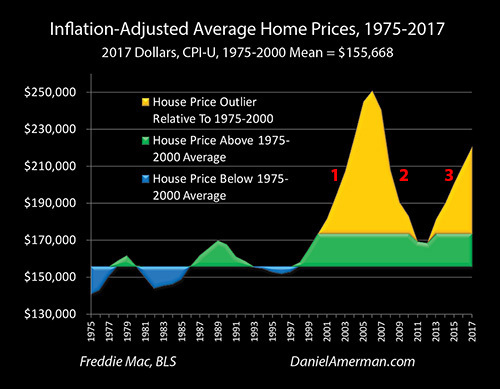 When a cycle of the containment of crisis is followed by a cycle of crisis, then we get the historic plunge in housing prices identified with red numeral "2", and cell D4. So the red numerals 1-2-3 on the housing price graph are cells C4-D4-C4 on the investment matrix, and form a map for cycles of the greatest real estate profits and losses on a national basis that we have seen in our lifetimes. This cycle of radical price changes and exaggerated housing profits and losses is not natural. It could not be anticipated by following the usual investment norm of studying historical performance from previous decades - which is the green and blue area on the left side of the graph. When the Fed's heavy-handed interventions in the current cycles of crisis moved into the outlier zone - so did prices and valuations, and they have remained outside the outer boundaries of the normal historical range almost continuously since that time. While the Five Graphs are a very useful quantitative approach for identifying the much greater opportunities and risks associated with housing prices in this time of cycles of amplified Federal Reserve market interventions - real estate is only one row of the investment matrix. Every other major investment category has also changed in a major way as a result of the cycles of crisis and the containment of crisis. A particularly potent and well proven money making opportunity can be found in the D3 cell, which is the intersection of the 3rd row of Bonds, and the "D" column of the Black/Red transition from the containment of crisis to crisis. 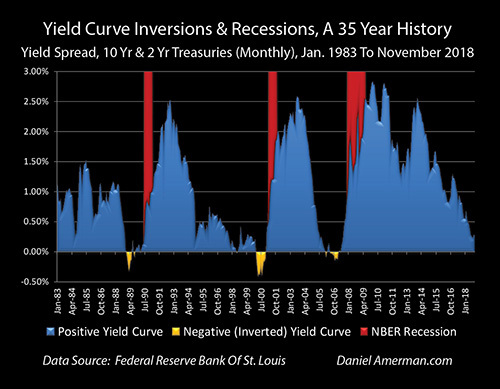 An aspect of this cell that has been much in the news is the remarkably powerful correlation between what is known as "yield curve inversions" and recessions. On a very uncommon basis, long term interest rates become lower than short term interest rates, as can be seen in the three golden zones in the graph above. All three times in the last 35 years - with no missed recessions or "false positives" - the red bars of recession have followed within 1-2 years of the inversion beginning. Now, if a 4th yield inversion does occur and if it is indeed then followed by a 4th recession within 1-2 years - the results could be catastrophic for many investors, and particularly so for those who have recently retired or are nearing planned retirement, because of "sequence of returns" risk. For obvious reasons, the potential yield curve inversion is therefore being presented as this terribly dark omen, meaning most people would place the implications in the "gloom & doom" category. As explored in the analysis linked here, however, yield curve inversions don't occur because of pessimism, but because too many professional investors see a beautiful investment opportunity at the same time. The fixed income professionals who make up the bond market and study the economy and markets every day - collectively come to see a high probability of a recession in the next 1-2 years. And seeing that likelihood - they see a change in the cycle on the way, and a likely radical change in the Fed's interventions. So instead of trying to directly "play" the likely recession - which can be difficult and imprecise - they "play" the Fed itself for the easier and more reliable large profits. So many professional investors try to cram into the "D3" matrix cell and arbitrage the change in the cycles at the same time, buying long term U.S. Treasury bonds with both hands, that they distort the natural shape of the entire U.S. bond and credit markets. The reason they do it - is that it works. Buying long bonds in anticipation of crisis and the Fed's reaction to crisis - which necessarily sends long bond prices soaring upwards - has been a remarkably successful investment strategy, with a perfect track record in recent decades. What we have looked at so far has been introductions to only five examples of the matrix cells: A4, B4, C4 and D4 for real estate and how they have transformed housing prices; and three highly successful investment examples for D3 and bond prices over a longer time frame. When the nation travels through a full round from beginning a cycle of crisis to the ending of the subsequent cycle of the containment of crisis - then all 32 matrix cells are in play for investors: the 24 cells of the individual investment categories (A1-D6); and the 8 strategy cells of how best to combine the risks and benefit from the opportunities in the individual investment categories (A7-D8). Some of the biggest moves of all are likely to occur in other cells and in other rows, such as stocks and precious metals - with widely varying results that are also likely outside the historical range, depending on the specifics of the columns and the cycles. Now, there are two critical things to keep in mind about the columns and cycles. The first is that they have dominated the markets - and the second is that they are not random. Because they are not random, this means that investors who understand the cycles can benefit from them in ways that are inaccessible to those who do not understand the cycles. "Martin Feldstein, who was chairman of the Council of Economic Advisors under President Reagan and is currently a Harvard professor, recently wrote an extraordinary editorial in the Wall Street Journal in which he strongly advocated that the Federal Reserve pursue policies that would: 1) continue to raise interest rates; and 2) thereby pop asset bubbles in the stock and commercial real estate markets; 3) which would cause an estimated $9+ trillion in investor losses; 4) possibly lead to another recession and the accompanying major job losses; and 5) would be followed by forcing interest rates down again to near historic lows." The analysis then goes on to a lengthy discussion of how an "insider's insider", the President Emeritus of the National Bureau Of Economic Research, in a prominent editorial in the Wall Street Journal that was written to rebuke President Trump for interfering with the Fed, would actually advocate inflicting what he estimated to be $9 trillion in stock losses and potentially cause a recession - for what he believes to be the good of the nation. For the average saver and investor - this likely sounds pretty awful and the reasoning near impossible to understand. On the other hand, for some of the professional investors and insiders who do understand what is happening - what can be found in the editorial is not gloom and despair, but rather the "ding-ding-ding" of a dinner bell being rung. What Feldstein is proposing - and he is not the only prominent economist to propose plans like this - is that interest rates be substantially raised, even if a crisis is the most likely result, with potentially catastrophic consequences for retirees with stock-heavy portfolios, as well as for those who are invested in commercial real estate REITs. The reason for doing so is for the purported greater good of the entire nation - so that interest rates get high enough that they can be slammed down with sufficient force to jolt the nation out of the next recession, if needed. The reasoning behind this basic aspect of macroeconomic monetary policy may sound a bit esoteric for most people, but let's return to our Red/Black matrix framework, and look at the very practical and even potentially life-changing implications for us all. Feldstein stipulates that as the result of the "exceptionally relaxed" monetary policies used to contain the damage from the Financial Crisis of 2008, interest rates are still far too low, asset bubbles have been formed, crisis is on the way anyway as a result, and therefore interest rates have to be raised so they can be lowered to escape that inevitable crisis. In other words - Feldstein's world view is one of "cycles of crisis and the containment of crisis" - as is the world view of many of the world's central bankers and economic decision makers, even if those particular words are not being used. So, even though he does not use those exact words, Feldstein sees us as currently being in Black column "B", a cycle of the containment of crisis. He (and many others) think Black/Red column "D" is on the way anyway, as the world follows a cycle of the containment of crisis with a new cycle of crisis. But what he is really worried about is Red/Black column "C", making sure the nation can once again exit crisis and return to a cycle of the containment of crisis, instead of the dire alternative of getting stuck in the Red "A" column of ongoing crisis. To hear the sound of one of the dinner bells ringing for many insiders, let's go back to that 3rd row of the matrix, that of bonds. Feldstein advocates: a) using the awesome powers of the Federal Reserve to first force interest rates upwards, which all else being equal, makes long bonds much cheaper to buy; and to then b) use the awesome powers of the Fed to swiftly force interest rates downwards to the unnatural place of near zero - and thereby create a maximum upwards movement in long bond prices. Perhaps the biggest information value of all from Feldstein's editorial and the many related works from central banks and prominent economists around the world, is that they do not see a random process, but rather they see deliberate central bank strategies, each of which involves a series of targeted interventions with anticipated consequences, and each of which is also likely to create extraordinary investment price changes in ways that are outside of the historical norms. 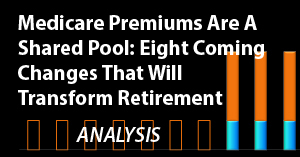 The investment price changes aren't what they are usually writing about or prescribing (Feldstein's editorial is unusually frank in this regard), but the connection is nonetheless direct and powerful. The impact is not the slightest bit random. And most importantly of all: the investment impacts occur in a sequence, the broad outlines of which can be seen in advance, just as do the sequential changes in monetary policy that accompany the changes in the cycles. When central banks distort the very nature of money itself and the fundamental firmament of the financial universe - they necessarily change every aspect of finance, investment pricing and investment returns. If we look at the "three beautiful arbitrages" then what we are seeing is a sequence of events, each of which is clearly understood in advance by both the central bankers causing the sequence, and the sophisticated professional investors profiting from the sequence. The Fed drives interest rates upwards, not specifically for the benefit of the insiders, but for economic reasons that the insiders know quite well, and in the process the Fed artificially creates lower bond prices than should exist - a perfect buying opportunity. When the Fed later smashes interest rates downwards to escape recession, they are not specifically doing it for the benefit of institutional investors, but the insiders know perfectly well what will happen at the next stage in the economic sequence, and what the investment impact will be. They know that the Fed can be relied upon to use its enormous powers to create higher bond prices than what would naturally exist, and that this will create both the tradable trend line and the ending maximum profit opportunity. That particular trade which uses the Fed to play the business cycle has been around for a long time. It predates the cycles of crisis and the containment of crisis, it has been highly reliable and highly profitable over the decades, but unless they were buying long bonds - most individual and retirement investors could be blissfully unaware of it. However, when the Federal Reserve went into crisis mode and broke out of numerous previous historical constraints in order to contain the damage from the two asset bubble collapses while keeping their member bank constituency (mostly) solvent - they greatly broadened and extended their impact on all investment markets, as well as individual financial planning and retirement investment strategies. With their unprecedented ZIRP (zero interest rate policies), the creation of literally trillions of dollars of new money out of thin air via quantitative easing, as well as the associated extraordinary funding of the mortgage markets and the Federal debt - the Fed became (and remains) a newly dominant influence across all investment categories. This then means that Fed actions and the sequence in which they occur have created new sequences for nontraditional risks and heightened opportunities in all of the major investment categories, which did not used to exist. For most investors, the largest impact of the cycles and the associated sequence of Fed interventions can be found in the A2 to D2 investment row of stocks. Traditionally, long term investors following a disciplined stock investment strategy could in theory ignore both the business cycle and the related central banking cycles. However, the underlying fundamentals work quite differently during cycles of crisis and the containment of crisis - even if the surface can look surprisingly similar at times. The term "rational bubbles" is part of the economic theory that such interventions as zero interest rate policies are based upon, and they are a critical aspect of investing for cycles of crisis and the containment of crisis. Unfortunately, "rational bubbles" are both inherently deceptive and extremely dangerous when it comes to stock investments by most individuals. For most people, high stock prices are very comforting. Elevated valuations can reinforce the beliefs that "normal" times have returned, mainstream investing is working again, and the days of worrying about crisis are long gone. Unfortunately, when cycles of elevated valuations are the result of "rational bubbles", it means that there will also be cycles of staggering blows, with much higher losses than would be expected in normal markets and economic circumstances. "That downturn is almost surely on its way. The likeliest cause would be a collapse in the high asset prices that have been created by the exceptionally relaxed monetary policy of the past decade. It’s too late to avoid an asset bubble: Equity prices already have risen far above the historical trend. The price/earnings ratio of the S&P 500 is now more than 50% higher than the all-time average, sitting at a level reached only three times in the past century. Commercial real-estate prices also are extremely high by historical standards. Looking at the world in a very similar way as that which is presented herein, Feldstein believes that the last decade of exceptional Federal Reserve interventions directly created an asset bubble in stocks, and that even a return to averages would inflict $9 trillion in stock losses for U.S. households. So, the same sequence of knowable Fed actions that institutional investors and insiders will likely use to immensely profit from the D3 cell, could at the same time be logically expected to inflict $9 trillion in damages (or more) on normal stock investors in the D2 cell. All for the purported good of the nation, of course, but with a good bit of wealth redistribution from less sophisticated to more sophisticated investors along the way. For the millions of investors who think they are buying into a healthy, normal market, but are instead actually buying into a rational bubble that has been created as the logical and expected byproduct of the heavy-handed Fed interventions that create a cycle of the containment of crisis - the results can be tragic, with major ramifications for lifestyle and financial security. However, for those who do understand the cycles and why rational bubbles are not random occurrences but expected features - this means that through understanding the sequences and the relationships, we may have the ability to earn substantially larger and more reliable profits from stock investments than should exist in the theoretical world of a "random walk" in stock prices, where the Fed had not burst out of its previous constraints. Two asset bubble collapses to date, and the radical expansion of the influence and powers of the Fed mean that long term stock investment strategies are not nearly as safe as they were previously assumed to be. But yet, when we understand and accept that 1) the sequences of the cycles of crisis and containment of crisis can create 2) amplified cycles of stock gains and losses that 3) are heavily influenced by the knowable sequence of monetary interventions by the Fed - the implications can be highly beneficial, rather than pessimistic or bleak. As explored in much more detail in my Five Graphs series, the sequence of extraordinary Federal Reserve monetary actions has created an entirely new and direct correlation with housing prices, that has created outlier profits and losses which far exceed prior historical real estate price cycles. Fed actions are not everything - much of real estate remains local and specific. But when we look at the nation as a whole, the price swings are not only much greater than they used to be, but they follow a sequence which is highly correlated (through several of the filters covered in the Five Graphs series) with the sequence of Federal Reserve actions. Those who can understand the Fed sequence then have a powerful advantage when it comes to anticipating the possible major real estate losses - and the potential record real estate gains - that may still be on the way. The real estate rows A4 to D4 in the matrix work quite differently than the A3 to D3 bond rows in terms of how they respond to cycles of crisis and the containment of crisis - but the associated profits can be far larger. The relationship between precious metals prices, cycles of crisis and the containment of crisis, and a sequence of monetary interventions that can be understood in advance - is one of the most interesting of all. Generally speaking, not trusting the Fed, expecting crisis, and seeing how the Fed's hubris could lead to monetary disaster are among the reasons that many people do buy gold and other precious metals. That said, the "barbarous relic" of the yellow metal can play a surprisingly sophisticated role in taking advantage not necessarily of the Federal Reserve collapsing, but rather the Fed following its own deeply flawed game. Most importantly, how the Fed has become such a dominant influence on precious metals prices can be understood and taken advantage of, without sacrificing the insurance component of what happens if there is another crisis and it is not contained the next time around. The viewpoint and perspectives presented herein fall outside of traditional financial planning. There are numerous academic assumptions that have been quite knowingly and deliberately violated. There is a bigger problem, however. Almost the entire investment world currently exists in violation of the assumptions that underlie the traditional financial theories and conventional financial planning that were developed in the 1950s to 1990s. We are not supposed to be investing in a world where the Federal Reserve eviscerated the traditional interest income pillar of retirement investing in order to save the financial institutions, thereby inflicting severe financial pain on millions of unsuspecting retirees over a period of many years. But it did. We weren't supposed to have the Financial Crisis, or the Great Recession, or the Fed creating trillions of dollars out of the nothingness to buy Federal debt while effectively controlling medium and long term interest rates. But that is what happened. We aren't supposed to live in a world where many of our largest trading partners are engaging in their own massive monetary experiments, buying vast sums of investments with newly created money while forcing literally negative interest rates on their financial systems. But we are, and global investment prices are being determined by what was supposed to be impossible. When we live amid the fantastic and the seemingly impossible, then it is only natural to expect collapse and monetary disaster. But instead, we have had years of seeming stability, eventual rapid economic growth in the United States, and a record of some of the highest investment prices in history having been achieved across multiple investment categories. To return to where this analysis started - the data just hasn't been fitting the model. None of this makes any sense from either the conventional mainstream or contrarian perspectives. On the other hand - and this is true in just about any field - if we use a model where the data actually fits, then the chances of understanding what is actually happening and what to do about become radically higher. Our chances of being blindsided by bad assumptions become sharply reduced. When change occurs and change is real - then most people would usually agree that the most healthy way of dealing with change is to try to understand it, rather than pretending it doesn't exist. This should be particularly true when it comes to something as important as our financial security and what could be our future standard of living for decades. Hopefully this analysis has provided some new insights for what has changed, and a framework for understanding some of the things that can be done about it. Learn more about the rest of the free book.